This is a Hand Signed White Card 4.5" x 3" by the English Author. 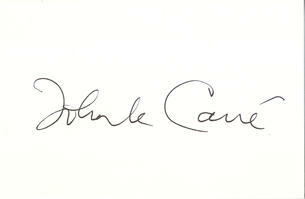 David John Moore Cornwell (born 19 October 1931), pen name John le Carré is a British author of espionage novels. During the 1950s and the 1960s, Cornwell worked for the Security Service and the Secret Intelligence Service, and began writing novels under a pen name. His third novel The Spy Who Came in from the Cold (1963) became an international best-seller, and it remains one of his best-known works. Following the success of this novel, he left MI6 to become a full-time author. Le Carré established himself as a writer of espionage fiction. In 2008, The Times ranked le Carré 22nd on its list of "The 50 greatest British writers since 1945".